UGSI Encore 700 diaphragm metering pump | JCI Industries Inc. The most simple and economical type of pump, these provide a pulsed flow with huge pressure spikes, considerable noise and wear. 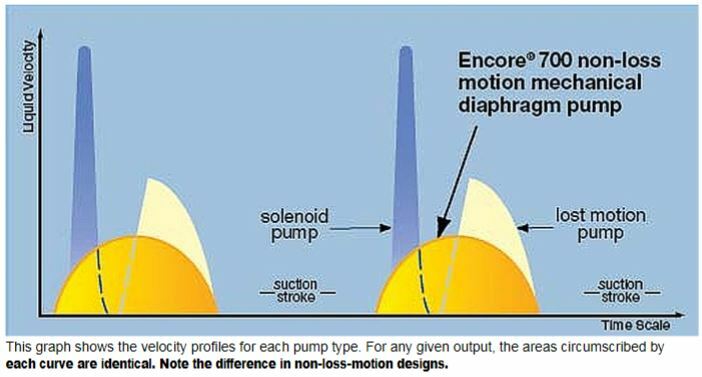 These motor-driven pumps are higher in capacity than solenoid pumps, but also give rapid acceleration to the liquid at rest in the pump head due to non-continuous diaphragm motion. 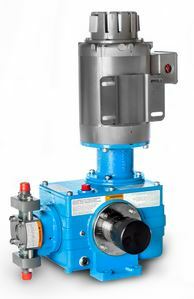 Unlike solenoid or loss of motion pumps, the Encore® 700 diaphragm metering pump is driven by a rotating crankshaft, where the eccentricity can be smoothly adjusted during operation. There are no return springs, and the diaphragm moves with simple harmonic motion. The fluid velocity profile is sinusoidal at all stroke lengths; adjusting stroke length simply alters the amplitude of the sine wave. This design provides reliability and longevity, and pump valves operate with far greater efficiency and minimal system vibration.